Lübeck is famous for its corridors and courtyards. These are remnants of medieval town planning. Behind the gable-side street houses in the Middle Ages, the so-called "stalls" were built. These were small, two-storey buildings, which had only one room per floor from their layout. In these booths lived the employees, day laborers and carriers of the trade, which was exercised in front in the street house. The aisles and courtyards are usually reached by a more or less narrow passage. The corridors are narrow alleyways with small to tiny houses to the left and right. The courtyards, on the other hand, usually extend around a small square, usually with a tree. At the end of the 17th Century existed in Lübeck more than 180 courses and courtyards. Today there are still about 90, which represent an urbanistic rarity, which contributed not insignificantly to the appointment of Lübeck's old town to a World Heritage Site by UNESCO in 1987. The corridors and courtyards bear characteristic names, for example, dark green corridor, Brandweinbrenner Gang, Fünfbudengang, Käselausgang or Glockengiesser Hof. Our house is located in the sable corridor and takes its name from a bricklayer who built several buildings in this corridor in 1803. The history of this corridor is much older and can be traced back to the year 1307. While formerly the passage and courtyard houses were reserved only for the "poor people", today these houses are mostly lovingly restored and are coveted living quarters for people who like to live in the city center and love a very special social "biotope" like it only can be found in the corridors and courtyards. High demands on a lot of space and high ceilings must not be allowed. Even our house is 20 m² floor area rather tiny and therefore offers enough space for a maximum of four adults. But it is very cozy and atmospheric with its open wooden beams and brick walls. Fully restored and modernized, it offers a high level of comfort despite its age. Right in the middle of Lübeck! We had a small panic just before we were supposed to check in. Something happened with my down-payment for this apartment and we weren't sure we were going to be able to stay here. The owner was great about it and we worked out an agreement. We arrived in Lübeck, accessed the apartment which is narrow, 3 stories tall, and completely not level. :) So quirky and unlike anything we've done before, we loved it. My husband and I stayed in the loft and my daughter slept on the futon. There is another bedroom on the first floor with the bathroom, but she preferred to be on an upper floor. This apartment is walking distance from anything and everything. We parked our car at Parkhaus Hüxstraße and then went everywhere on foot. This was our favorite place to explore on our vacation. Peaceful, scenic, unusual architecture, excellent cafes,.... We highly recommend staying here. Fint, rent og pænt, meget tæt på byen. 1 minus at der ikke var Wifi, da vi havde børn med. Været der i forbindelse med julemarked 14-16 dec.
Tolle Lage, sauber und ordentlich. In einigen Dingen, die man nicht sofort bemerkt, nachlässig: einige Lichtschalter ohne Funktion, Lampen funktionieren nicht, Fernseherantenne taugt nur für wenige Programme. Klein, aber fein. Wunderbare Zentrumslage, trotzdem absolut ruhig. Sauber und liebevoll restauriert. Nur die Küche ist sehr klein. Entgegen der Angabe in der Objektbeschreibung leider kein Internet-Zugang vorhanden gewesen. 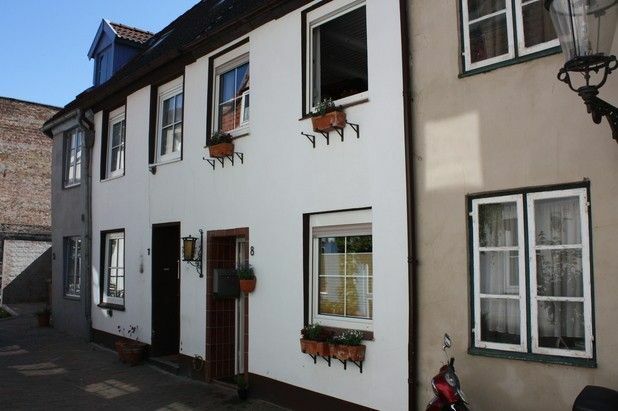 Ansonsten ein schönes kleines Haus mit viel Charme das sehr zentral gelegen ist sodass alles fußläufig erreichbar ist. Nur die Nachbarn sind gelegentlich etwas laut und die Matratze im Erdgeschoss recht unbequem. The house is located in the middle of Lübeck's old town in the Schlumacherstraße, which represents a connecting road between the Hüxstraße and the Fleischhauerstraße. The roads in the area are all traffic-calmed game roads. Parking lots can be found in large numbers on the 5 minute walk away Kanalstraße on the Trave (unfortunately subject to a charge). In particular, the Hüxstraße is a busy shopping street with more than 100 small, very individual shops, bars and restaurants. The main attractions of Lübeck's old town are easy to get by on foot. Even shops and discounters for self-catering are within easy walking distance. Nearby is the Kunsthalle and St.-Annen Museum, the Museum of Archeology, the Jewish Community Center, the swimming pool Krähenteich and interesting remains of the old city wall. But also the very trendy disco "parking garage" can be reached in 5 minutes on foot (Hüxterdamm 3).